One of the highlights and great delights in the life of any lodge is to initiate new members and on this occasion, Mark Edwards was initiated into Prince’s Park Lodge No 4769. To honour that fact, all the members of the lodge were present. Peter Ryan (left) congratulates Mark Edwards. 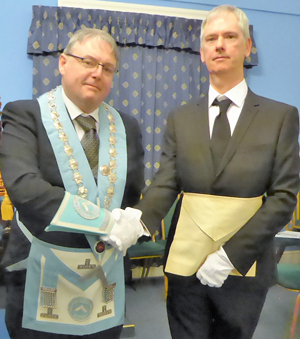 Mark had attended many of the lodge’s social functions and as a friend of the WM Peter Ryan, eventually asked about Freemasonry. After hearing what Freemasonry is about, Mark asked about joining, as he felt it would be an enhancement of his daily life. The rest is history! Prior to the ceremony, the WM, who was his proposer and Vic Albin, his seconder, met with Mark to put him at ease, asking him to sign the declaration book prior to the treasurer asking him for dues. The lodge DC Andrew Mooney requested the brethren to stand to allow the WM and his wardens to enter the lodge and take their places, after which the minutes of the last regular meeting were confirmed and signed. The WM asked Andrew Mooney to occupy the chair for the ceremony, which he gratefully accepted. The secretary read out the details of the candidate and Mark was then announced having been prepared by the tyler Tommy Lunt. In what can only be described as a flawless and sincere ceremony, showcasing the dedication of the participating officers, the deacons Peter Williams and Stan Bradley, accompanied Mark throughout the ceremony, whilst he was initiated into the lodge. The working tools of an entered apprentice Freemason were explained by junior warden Geoffrey Cowan and the charge after initiation was delivered in an exemplary manner by senior warden Reg Dunscombe. Mark retired to restore himself to his personal comforts and on his return to the lodge the Woolton Group Chairman Andrew Whittle presented Mark with his first set of gloves, providing an explanation as to why they are worn. Andrew Mooney requested that the WM return to the chair so that the rising could take place. The Woolton Group Mentor Harry White presented Mark with an explanation of the initiation ceremony. After the secretary had read the communications from grand lodge and Provincial grand lodge, he informed the brethren, that after great deliberation and with much sadness, it had been decided that the lodge would hand in its warrant in December. Like so many lodges, Prince’s Park has suffered from a lack of candidates and all the past masters have been recycled on many occasions through the chair. It is always sad when a lodge decides to close, especially when there is such dedication for ritual from the brethren, as was shown on this occasion. The lodge was closed in due form and the brethren retired to the festive board to continue the celebrations. Pictured from left to right, are: (left picture) Andrew Whittle, Mark Edwards and Peter Ryan. (right picture) Harry White, Mark Edwards and Peter Ryan.